Within discussions of Orthodoxy, the Holy Mountain of Mt. Athos does get mentioned many times. Mt. Athos itself is what we call a "Spiritual Republic". It is an independent state which pledges allegiance only to Almighty God. Mt. Athos which is perched on a peninsula 20 miles long and seven miles wide is off the Macedonian Coast The monasteries there are among the oldest in Christendom. Monks, hermits and holy men have lived there since the third century. During the Byzantine Era, the total population exceeded 50,000. No women have ever been allowed on Mt. Athos. The Blessed Ever-Virgin Mary, the Mother of God, is the "Patron Saint" of the Spiritual Republic of Mt. Athos. In one of the magnificent monasteries there is a huge icon on the Blessed Virgin Mary which has been titled "Axion Esti", meaning 'it is worthy to bless Thee, the Virgin'. This beautiful icon was painted in the seventh century and has since graced the sacred walls of the Cathedral of Mt. Athos. On June 11, 980 AD, as a group of monks were conducting an all-night vigil before the icon of the Blessed Virgin Mary, they suddenly noticed a monk standing on the right of the icon whom they did not recognise at all. He was unknown to the monks, and no one could explain his abrupt presence. This unidentified monk began to chant the beautiful hymn written by St. Cosmas, but rather began with the words "Axion Esti os Alethos Makarizin Se Tin Theotokon", which means "It is very meet to bless Thee, Theotokos the ever blessed and most pure Virgin and Mother of God". The monk then explained to the others that he was the Archangel Gabriel and that these words should be added to the hymn. The Arch-angel then vanished from their sight, leaving the monks amazed at the power of God. Since that day on June 11, 980 AD, the additional words to the hymn of St. Cosmas have been sung by all Orthodox Christians around the world. 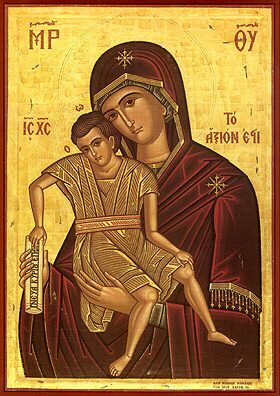 The icon of the Blessed Mother Axion Esti is still venerated today in the Cathedral of Mt. Athos. "It is meet indeed to bless Thee, the ever-blessed and most pure and Mother of our God. Thee that art more honourable than the Cherubim, and incomparably more glorious than the Seraphim, who without spot of sin didst bear God the Word; Thee, verily the Mother of God, we magnify". This article has been translated into French here.